This was crazy. 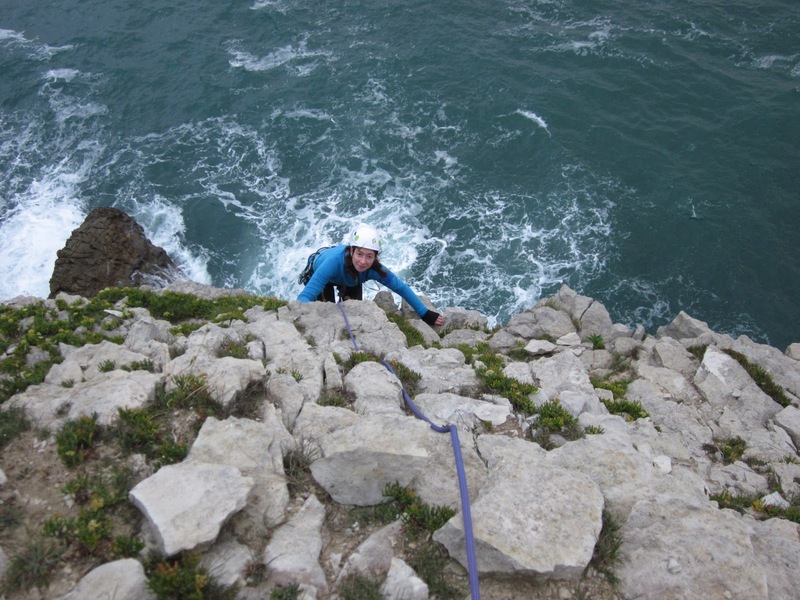 Below me, a knobbly depression in the cliff face – known as the Lecture Theatre – was my only way of getting down to the ledge that was currently being pummelled by the ocean. I gripped the rope tighter and squeezed my eyes shut only to open them when two seasoned rock climbers scrambled past down to the bottom, without the assistance of ropes. I pretended I was taking a breather and enjoying the view. And, indeed, the view was lovely. A mass of empty blue-green ripples stretched out to the horizon where it was met by the grey smudge of sky, while around me, steep, chiselled cliffs loomed out of the froth. If I didn’t know better I would have said I was standing on the edge of the world. My boyfriend and I had come to Swanage, on the South West coast of England. The coastal path was wild and windswept. But we weren’t here for the sea air, nor to stretch our legs along the cracked-earth path. We were here to experience climbing sea cliffs for the first time. At home, it hadn’t seemed quite as scary – the photos picturesque with blue skies and promises of picnics. But standing there buffeted by the wind, amid the gloom of an overcast day, I wasn’t smelling any roses. This was the real McCoy, and boy was I scared. But I had somehow accomplished the first part of the abseil down so I figured I might as well carry on – the irony of having to get down to climb back up did not escape me, nor did the fact that this was probably the easy part of the whole process. Before long I reached the water’s edge and the immensity of the sea cliffs reared up around me, dwarfing me. I had been warned that Swanage could be overwhelming. It was true. This, however, was just the start of what was to come. What goes down the sea cliffs must come back up again. As the boyfriend set off on the trad climb – an easy route, I had been promised – I watched nervously, feeding out the rope, as he clung to the rock with one hand, the other putting in place the equipment that needed to hold his weight. 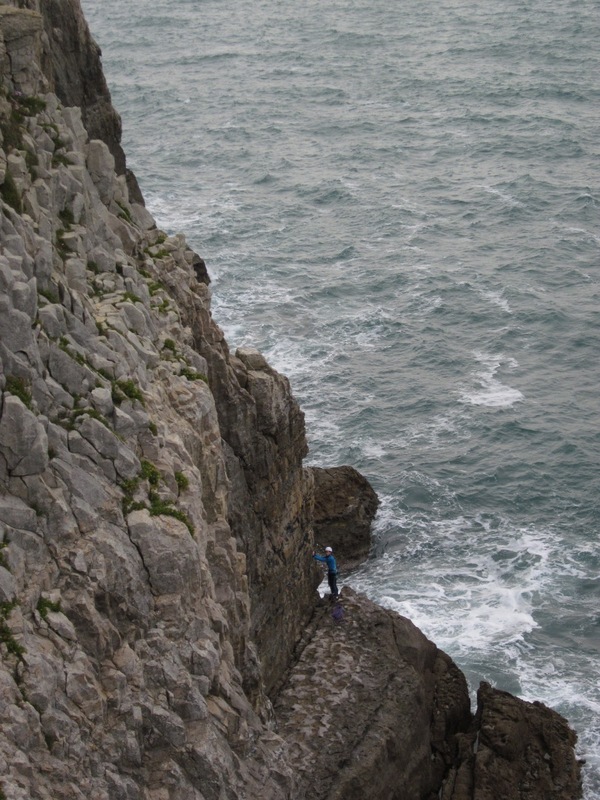 Then he climbed over a jagged edge and was lost from view as he continued to the top. For near on 30 minutes I patiently fed out the rope when he tugged for more, watching the waves crash at my feet, feeling the spray on my face and trying to push dark thoughts from my mind. Then he was at the top, waving at me, though I couldn’t hear his shouts against the background chorus of wind and waves. He signalled for me to get ready to climb. All the bravado I’d put on evaporated in a rush. I shook my head. “No way, I’m not going up there,” I shouted, though it came out more like a whimper. He put his hands together in prayer, pleading with me to make the climb (and collect his valuable climbing gear that he had wedged in the rocks during his ascent). I pondered the situation. I was literally stuck between a rock and a hard place (and a wet, angry ocean). The only way out was up. I took a deep breath, gathered the courage and tied myself in. I began to climb. The rock was jagged, nasty and sharp under my hands, slicing into my flesh as I hung precariously, one hand holding on for dear life, the other removing the costly and precious nuts from the cracks. Then all of a sudden I was over the worst of it and the rest of the climb was not so much steep cliff but more a relatively straight-forward scramble up a slope. It was almost easy. I got to the top and sought safety. It was only then I looked back down at the waves, foaming as if in anger, rearing up as if to nip the ankles of climbers. Relief flooded my body. I did it. I made the climb, all the way to the top. I mini fist pumped. What a thrill; my first trad climb. But I achieved more than just climbing a sea cliff. I also fought the negative demons in my head; the ones that stoked the “I can’t” fires. If I had listened to those voices I would have continued to sit at the top of the cliff feeling sorry for myself, woefully watching the other climbers with envy. The unknown and new is always scary. Getting over that mental hurdle is the tricky bit but it’s not impossible. It’s also easier when you know the rewards are great for achieving it. The one thing I have learnt from this experience is that getting over that initial hurdle not only boosts your confidence, it also makes it that little bit easier to fight the other “I can’ts” that might plague you. That’s when you know you’re mastering your fear – and that’s a bloody great feeling. Holy Moly, that is some cliff face! Well done on digging deep to find your courage. I am so impressed. I am wondering how, in the rush of euphoria that you Can Do It, you also keep a perspective on your abilities? I know from my own experience how easy it is to get carried away and overreach my abilities. How are you marking your progress in a way that advances your skills forward but not in a way that makes you over cocky or foolhardy? You make a good point. One advantage of rock climbing is that each climb is graded on its difficulty. In this way you can keep within your climbing range and slowly push yourself on the next grade up. Furthermore I also know I'm still lacking in climbing technique (ie the art of climbing, like ballet) and I'm still needing to build up my strength, which is what would help me achieve more difficult climbs. But like any activity, it doesn't matter how good you are, you have to be aware of the external factors like the environment, weather, other people because those will be the things that ultimately get you if you aren't prepared.